Usually every Wednesday we will get ranking updates from our Raven Tools platform we use to manage local internet marketing for our clients and our web properties. We checked this morning to see if our Phoenix SEO update from last week changed again after adding “Phoenix SEO” back to the site title and cleaning up our dedicated page within the site for Phoenix SEO. It did change as we moved back to the 5th position. We had a page title before that was too long and weren’t the primary keywords Phoenix SEO or Phoenix SEO Company but variations so we wouldn’t duplicate our site title. Since we took it out of the site title we used it on this page instead and cleaned it up. 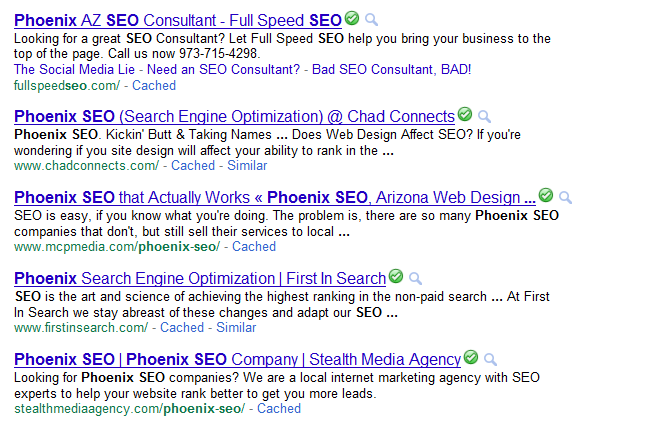 Google likes that page for Phoenix SEO so we removed it from our site title today since this page is still showing on the first page after making the changes earlier. It also moved back to the 5th position and looks cleaner in the search result pages. So today we went back to a cleaner Site Title for Local internet marketing and we will keep checking and monitoring the results. We will keep you posted with any other updates that can be helpful for your internet marketing strategies.